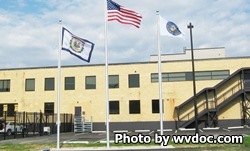 Charleston Correctional Center opened in 2015 and is one of the newest facilities in West Virginia. This facility effectively replaced the Charleston Work Release Center. Charleston Correctional Center is a coed facility and operates a residential substance abuse treatment program for up to 32 women, and a 96 bed coed work release unit. Inmates in the work release unit are employed in the surrounding community. They report to their job during the day to earn a wage, and return to the facility at the end of their shift. Offenders in the work release unit must pay rent to the facility, and use a portion of their funds to pay down any outstanding court fines/fees or owed child support. To qualify for work release offenders must be within 18 months of discharge, and deemed a low risk offender. Additionally inmates in the work release unit are required to donate at least 80 hours of community service. Inmates in the Residential Substance Abuse Treatment Program must be within twenty four months of their release date. In addition to substance abuse counseling, inmates in the RSAT program can receive courses on parenting, financial planning, and classes on how to prepare for job interviews. Once the offender has completed the RSAT program they can transfer into the work release unit. Inmates in the Charleston Correctional Center Work Release Unit can earn incentives for good behavior that include two hour passes, and overnight furloughs with immediate family members. All inmates are subject to random drug and alcohol testing, additionally inmates on work release are randomly checked during employment inspections. Before you can visit you must have an approved visitors application on file. Visitation occurs on Saturdays and Sundays from 1pm-4pm.